Almost one year passed but my visit in Canada still memorable with me, maybe because I loved the places that I saw in this country. For the last weeks that I stayed in Edmonton, I considered visiting a famous park during spring and summer season. I remembered that I planned to go to Fort Edmonton Park last May 24 2008, Saturday but what happened that day was I took a bus going to the park and the bus stopped at the park bus stop but suddenly I changed my plan and I went home. The actual tour at Fort Edmonton Park did materialized last May 31 2008, Saturday. That time, I was firm in my decision to see the park or else I will not be able to visit it anymore. I went at the park in the afternoon. But before going to the park, there was incident that I waited for an hour for the bus going directly to the park. I was in Alberta University bus stop station that time because I got a pamphlet of bus saying that it goes to the park every weekend, but my mistake was that, the bus schedule was only Sunday and not Saturday. After waiting for an hour, I decided to take a bus going to West Edmonton Mall since it will stop either in Whitemud or Fox Drive bus stop which near in the park. After arriving at the bus stop, I thought the entrance gate was near, but I walked for a while until I reached it. 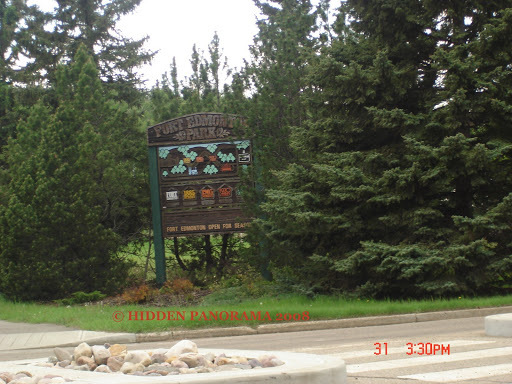 My curiosity to visit this historical park started when someone from the office mentioned to me that what I can see at the parkland are the old days of Edmonton, 18Th to early 19Th century period of the city. And another one told me that I will see people wherein they will reenact the old century time and for me that was amazing. Next, I went to the streetcar station near the steam train station. And I waited for the approaching streetcar. I saw a lot of people inside it. And I knew they enjoyed the trip. I checked my park map and found the trail of the street car. I decided to take a ride because I knew I do not have enough time to stroll around the parkland. While riding with the streetcar, I saw 1920’s and 1905’s street together with the houses and building structures during those time. And I felt like I was living in the past for a moment. Since it was a short ride, I grabbed all my chance to take pictures. Based on the pamphlets that I was holding, 1905 is called as Municipal Era wherein I found few churches, post office, Bank of Montreal, Fire Hall and Police Station. After the streetcar rides, I went back to the steam train station to experience the classic train. What do I expect in the steam train? One was the whistle sound of the train which the same of what I heard in the movies. Before I hopped in to the train, I approached one woman dressed in 18Th century and I requested if I can take picture with her and she agreed. There were lots of people inside the train. Mostly were families, parents and their kids. The last stop of the train was near at “The Fort” (Fur Trading Area), I walked for few minutes until I reached “The Fort” gate. “The Fort” was a place for fur trading and what I saw was a place in its earlier time from late 17Th to 18Th century. “The Fort” showcased what the community looks like during the old centuries. The place also shows the architectural design of home which made of woods and houses with small windows. Most of the houses has its brick fireplace and chimney. Not only the walls shows its era, but also the flooring, the tables, chairs and beds. While looking inside the houses I felt like I was living in the past again. While wandering the other part of “The Fort”, I am wondering the purpose of fur and I realized that Edmonton is located near North wherein the weather is winter more than a half year round. I can imagine that people living in this place needs fur for the winter season. And Canada has its native people which they call it “First Nation” which are Indians and their life used to hunt animals and the skin animals are being used as a fur. After “The Fort” area, I continued the exploration of this historical park. I found Native Camp wherein I saw an Indian lady (which represents first nation of Canada). I had my photo with her as my souvenir. I found an open store and I bought a boat display to remember Fort Edmonton Park. Next destination was the 1885 street. The street called as Settlement Era. From this place I found school, carpentry shop, jewelry, Methodist church, drug store and bakery. I checked almost all building structure in this avenue. I was amazed for all the things that I saw. A truly 1885 street. The avenue, shows that during this time, the people lived that time showed that their lives improved compared with fur trading time. After 1885 street, I continue strolling up to 1905 street, I found a barn and farm house. Then, some of the stores which already closed because its past 6PM. It made me sad but I can not do anything about. There was no train anymore and because of that I have to walk from 1905 to the exit gate. I passed again the 1920 lane. And what I did was capture scenery as many as I can. The trip was great and I titled it as “Back To The Past Tour”. Fort Edmonton Park – A Park that made me felt back in time of Canada. I enjoyed your trip to Canada. I hope to see all those places one day. Lovely photos. Rajesh, Layhoon, Glennis –> thanks for dropping by. I just love telling story about my travel experiences. What a wonderful place, I would love to visit the Indian trading store and the Native village, so much history in this park, no wonder it lives vividly in your memory. It’s seem a fun trip to go.